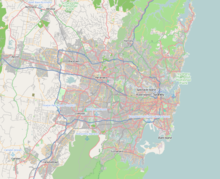 Sydney (Kingsford Smith) Airport (colloquially Mascot Airport, Kingsford Smith Airport, or Sydney Airport; IATA: SYD, ICAO: YSSY; ASX: SYD) is an international airport in Sydney, Australia located 8 km (5 mi) south of Sydney city centre, in the suburb of Mascot. The airport is owned by the ASX-listed Sydney Airport Group. It is the primary airport serving Sydney, and is a primary hub for Qantas, as well as a secondary hub for Virgin Australia and Jetstar Airways. Situated next to Botany Bay, the airport has three runways, colloquially known as the east–west, north–south and third runways. Tail of a Qantas Boeing 747-400 at Sydney Airport with the skyline of Sydney in the background. In 1933 the first gravel runways were built. By 1949 the airport had three runways – the 1,085-metre (3,560 ft) 11/29, the 1,190-metre (3,904 ft) 16/34 and the 1,787-metre (5,863 ft) 04/22. The Sydenham to Botany railway line crossed the latter runway approximately 150 metres (490 ft) from the northern end and was protected by special safeworking facilities. The Cooks River was diverted away from the area in 1947–52 to provide more land for the airport and other small streams were filled. When Mascot was declared an aerodrome in 1920 it was known as Sydney Airport. On 14 August 1936 the airport was renamed Sydney (Kingsford Smith) Airport in honour of pioneering Australian aviator Sir Charles Kingsford Smith. Up to the early 1960s the majority of Sydney-siders referred to the airport as Mascot. The first paved runway was 07/25 and the next one constructed was 16/34 (now 16R/34L), extended into Botany Bay, starting in 1959, to accommodate jet aircraft. Runway 07/25 is used mainly by lighter aircraft, but is used by all aircraft including Airbus A380s when conditions require. Runway 16R is presently the longest operational runway in Australia, with a paved length of 4,400 m (14,300 ft) and 3,920 m (12,850 ft) between the zebra thresholds. Since the international terminal's original completion, it has undergone two large expansions. One such expansion is underway and will stretch over twenty years (2005–25). This will include an additional high-rise office block, the construction of a multi-level car park, the expansion of both international and domestic terminals. These expansions—and other plans and policies by Macquarie Bank for airport operations—are seen as controversial, as they are performed without the legal oversight of local councils, which usually act as the local planning authority for such developments. As of April 2006[update], some of the proposed development has been scaled back. The local, state and federal governments have investigated the viability of building a second major airport in Sydney since the 1940s. Significant passenger growth at Sydney Airport indicates the potential need for a second airport — for example, total passenger numbers increased from less than 10 million in 1985–86 to over 25 million in 2000–01, and over 40 million in 2015–16. This growth is expected to continue, with Sydney region passenger demand forecast to reach 87 million passengers by 2035. ^ "Sydney airport – Economic and social impacts". Ecquants. Retrieved 7 September 2013. ^ "Airport Curfews – General Information" (PDF). Archived from the original (PDF) on 1 November 2012. Retrieved 27 January 2013. ^ "International Terminal – Expansion and Upgrade". Sydneyairport.com.au. Archived from the original on 25 August 2010. Retrieved 26 October 2010. ^ Ghee, Ryan (2012). "Integrated Terminals Central to Sydney Airport Vision". ACI Asia-Pacific Airports. PPS Publications Ltd. (Winter 2012): 13–14. ^ "Beijing Capital schedules Qingdao – Sydney launch in Oct 2017". routesonline. Retrieved 24 July 2017. ^ "China Eastern reopens Wuhan – Sydney reservation from late-Jan 2017". routesonline. Retrieved 5 January 2017. ^ airlineroute (9 September 2016). "Hainan Airlines this week opened reservation for Changsha – Sydney flights on/after 30OCT16. 2 wkly flights will begin on 12SEP16". Retrieved 11 June 2017. ^ "Hainan Airlines schedules Haikou – Sydney launch in 1Q18". routesonline. Retrieved 20 November 2017. ^ 2017, UBM (UK) Ltd. "Jetstar adds Sydney – Proserpine route from April 2017". Retrieved 11 June 2017. ^ "QANTAS TO LAUNCH SEASONAL FLIGHTS TO SAPPORO". 18 April 2019. Retrieved 18 April 2019. ^ 2017, UBM (UK) Ltd. "United adds Houston – Sydney service from Jan 2018". ^ "Second Sydney Airport – A Chronology". www.aph.gov.au. Archived from the original on 2 December 2008. Retrieved 23 July 2008. ^ Air Safety Investigation Branch (1970). Accident Investigation Report – Boeing 707-321B Aircraft N892PA at Sydney (Kingsford-Smith) Airport, on 1st December 1969 (pdf). Department of Civil Aviation, Australia. Retrieved 26 October 2010.